Caboose 1214 at Sherman, Texas in November 1980. GP15-1 102 at St. Louis, Missouri in October 1978. This is the Mechanical Department’s service tracks area on the north side of Lindenwood Yard. The distinctive sand tower stood east of the diesel shop. 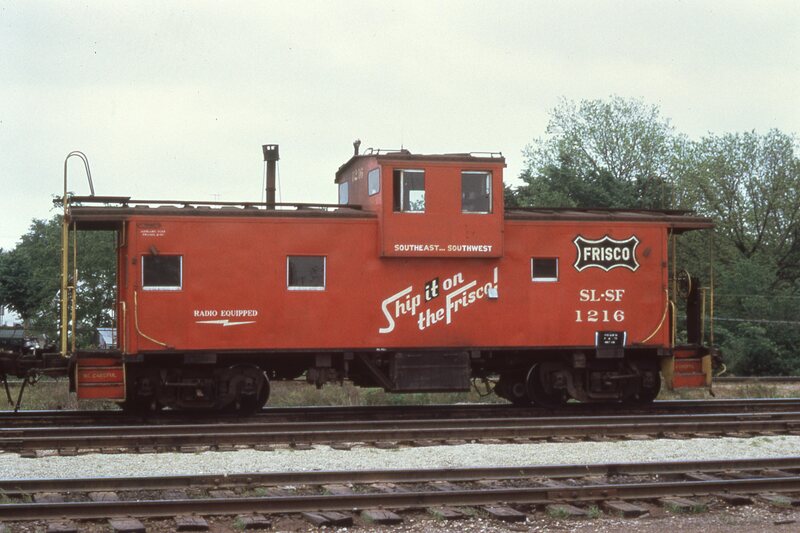 The sand tower appears in other photos at this location in the Frisco Archive. Caboose 1216 at Sherman, Texas in April 1973. 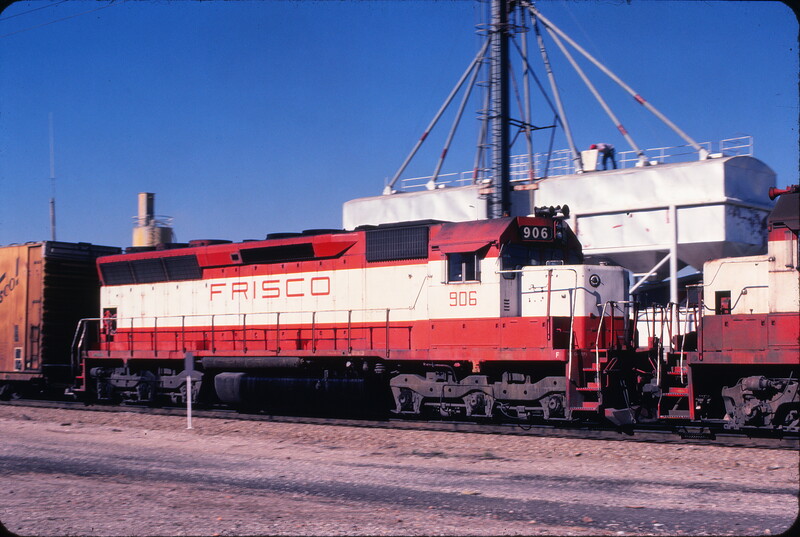 SD45 906 at Aurora, Missouri in December 1979 (Bob Dye). This train is eastbound on the Springfield Subdivision. 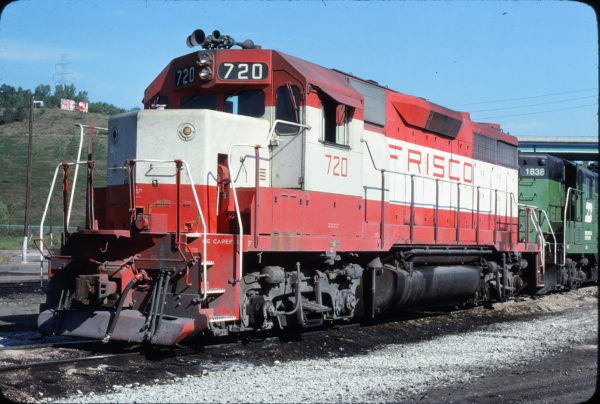 The train is just before the North Elliott Avenue crossing at mile post 268.74. 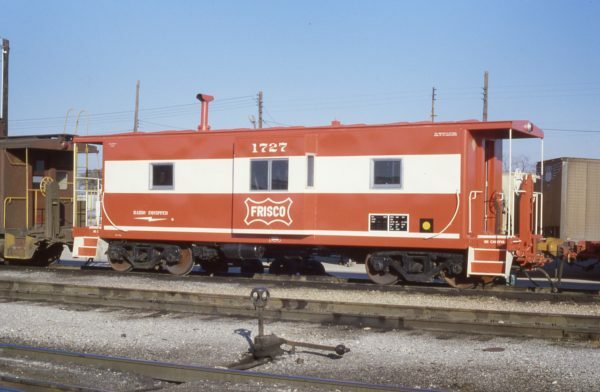 The Frisco depot (MP 268.9) is south of the tracks, one block to the west. Its address is 100 South Madison Avenue. 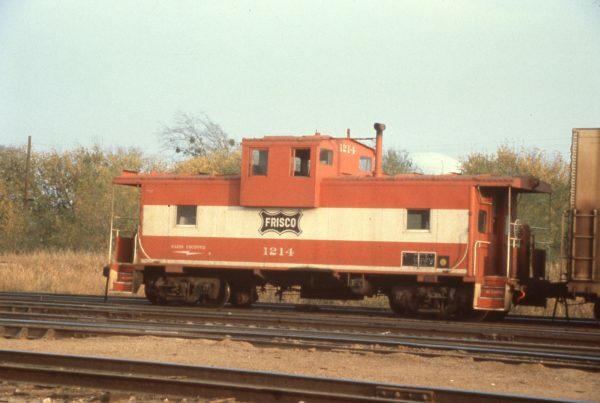 Further west, just beyond the depot is the Missouri Pacific diamond crossing at MP 269.0. This railroad crossing at grade is protected by an automatic interlocking. The train’s locomotive consist includes at least four units. These include GP38-2s 458 and 473, an unidentified EMD unit and SD45 906. SD45 906 is being moved dead in consist. 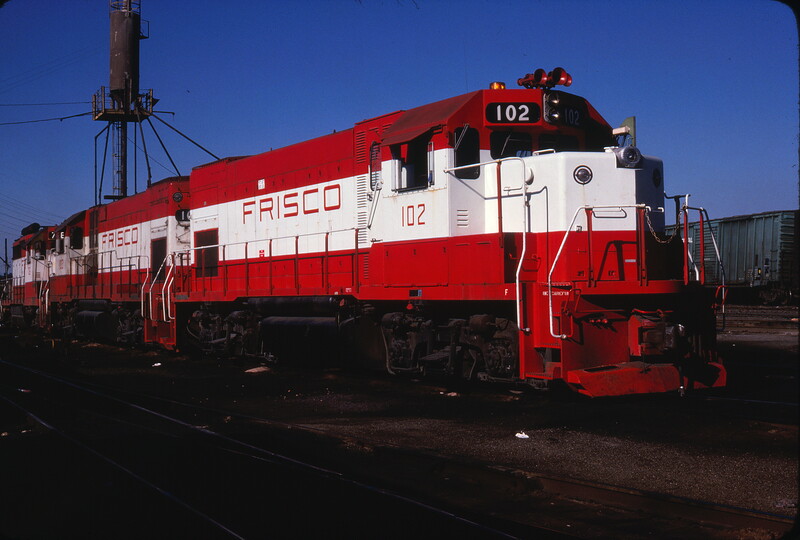 Note that there is no multiple unit electrical cable, the crossover step on the unidentified unit is up and the crossover chains are not connected between the units. 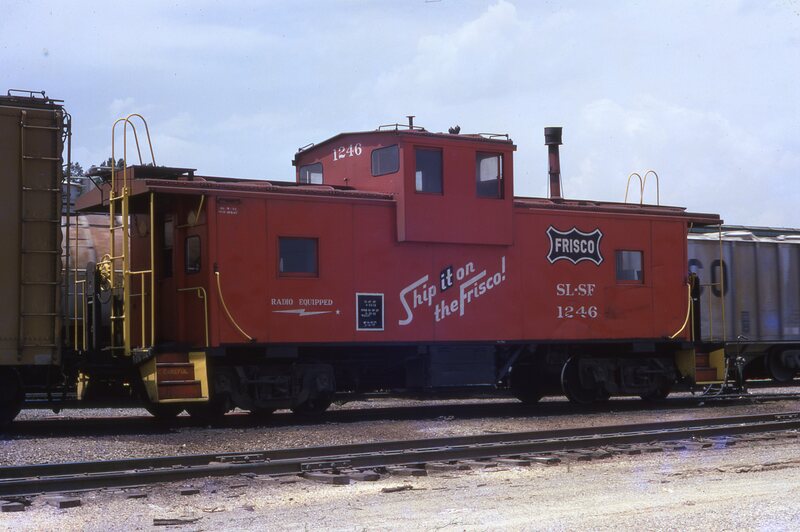 Please see this related Frisco Archive image. The elevator leg, distribution pipes and hopper storage bins are located at the Aurora Agri-Center. They are located at 29 North Elliott Avenue. In the distance above the locomotive’s radiator section is part of a ready-mix concrete batch plant. The business is Kay Concrete Materials at 30 East Mill Street. Just behind the photographer is the Elliott Avenue grade crossing with the Missouri Pacific Railroad. This route is the southern section of the MoP’s Carthage Subdivision. One half mile to the north (compass west) their north/south line crosses the Frisco at MoP’s MP 489.6. On the immediate southwest quadrant of the Elliott Avenue crossing is their brick depot at 121 East Olive Street at their MP 489.1. Today, this depot is co-occupied by the Aurora Chamber of Commerce and Aurora Historical Society. The view is looking north northeast. 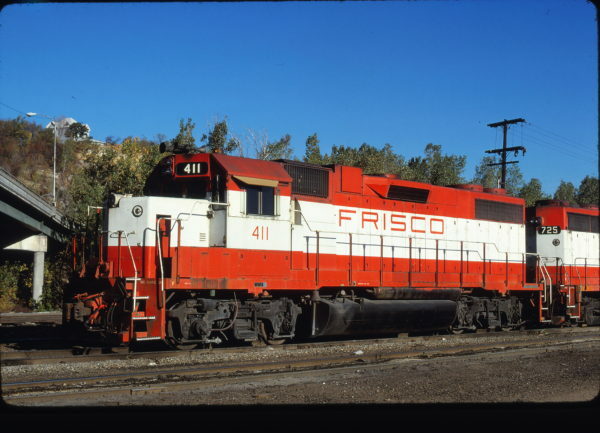 GP38-2 411 at Kansas City, Kansas on October 21, 1980 (James Primm). 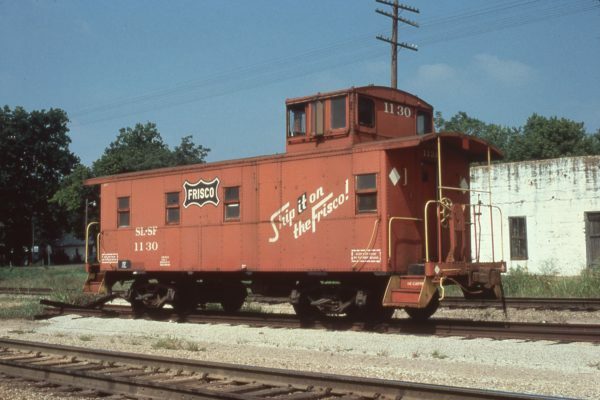 Caboose 1130 at Willow Springs, Missouri in September 1979. GP35 720 at Omaha, Nebraska in September 1979 (Jerry Bosanek). Caboose 1727 (location unknown) in November 1979. 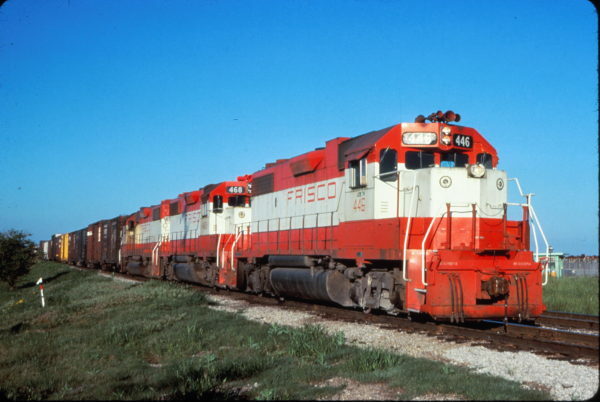 GP38-2s 446 and 468 lead a train (date and location unknown). Caboose 1246 at Memphis,Tennessee in June 1973 (H. Robey).